One of the favourite Swiss national outdoor pursuits is hiking. The very first longer hike I can remember was in the early days of my childhood in the late 50s. 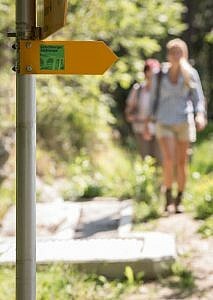 We lived as an extended family of six together with my grandparents when Bern-Lötschberg-Simplon Railway offered an excursion promotion to a new hiking trail on the Valais side of the mountain. The ‘Südrampe’ or Southern Ramp went from the station at Hohtenn all the way to Brig. My father, an enthusiastic outdoors man, decided this was too good an offer to miss. In order to maximize the savings on a family ticket, he invited some of his siblings with spouses and my grandfather on the hike. You got a really good deal when you had ten people! It was around 5 am on a beautiful day in June when we all walked down to Berne main train station. In the little ‘Milchgässli’ alley beside the Burgerspital (retirement home for Bernese burghers (citizens), we saw milk from farms in the countryside being loaded on to horse-drawn wagons for distribution to dairy shops around town. 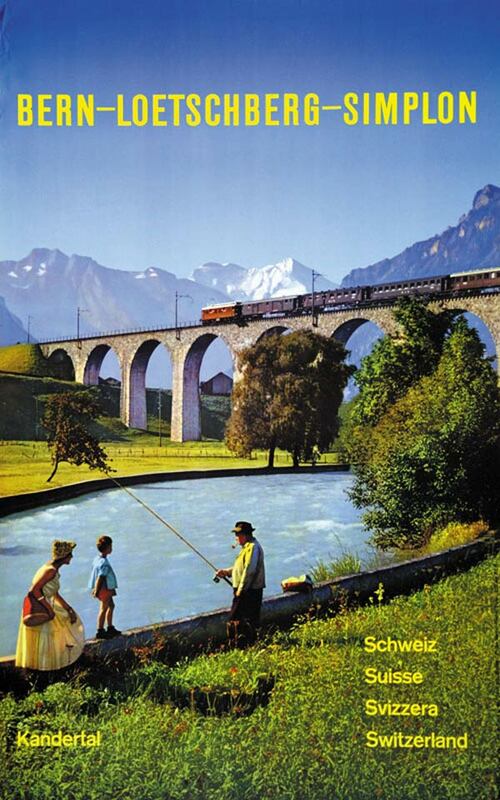 We boarded the first train to the Valais via the Bernese Oberland, past Spiez to Frutigen. From there, the line took a couple of loops to climb to the lovely station of Blausee. After a short time we plunged into the dark hole of the Lötschberg tunnel to emerge after a few minutes on the Valais side at Hohtenn station. We got off with a gaggle of other hikers (the special ticket price was popular) and assembled to check that everybody was ready for the hike. 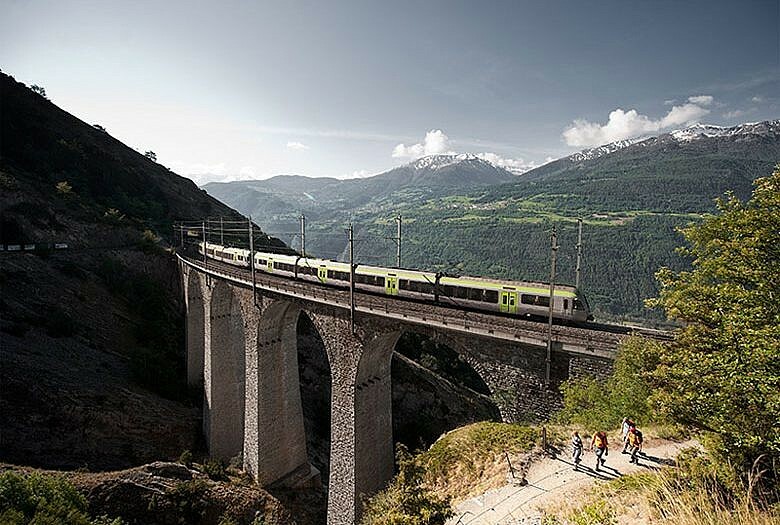 The path clung to the sides of the steep Rhone valley, mainly following the rail line, and afforded great vistas towards the Valais Alps. Far below us we could see market garden fields with crops like tomatoes and strawberries, apricots, peaches, pears and more. On the hills immediately below us, the mountainside was covered with vineyards. Lunchtime soon approached and we sought a shady place to sit and unpack our picnic. Everywhere groups of hikers were doing the same so we carried on, noting a definite drop of conviviality between my father and my mother and the rest of the family, in particular my grandfather who had been persuaded to come at the last moment and was suffering under the ever-increasing heat. Having come on the walk with jacket, walking stick, binoculars, and white linen cap, he finally took his jacket off. Just as we were about to revolt, we discovered a nice place under some trees beside a small irrigation ditch known as Suonen (Suns.) The Suonens bring precious water to orchards and vineyards and are said to have been built even before the Romans colonized the valley. 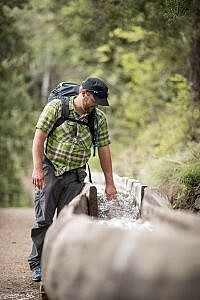 Having carried my knapsack, which included rain gear and a brand new yellow and blue plastic drinking bottle with sweetened tea, and complaining all the way about its weight, I was glad to remove it. No fires were allowed so the obligatory cervelat sausages had to be eaten cold. I wanted to wade in the water but was forbidden because taking off shoes would make my feet swell. The weather was becoming rather humid and after a heated discussion, the decision was made to split into two groups. The men and my aunt Trudy would be the group to walk faster and reach Brig in good time and the others, including Grandpa, my mother, sister and me, would follow and go to the nearest train station, Lalden. The weather had turned overcast and black clouds were closing in. We got our raingear out; now I was happy to have carried it all the way. Grandfather put his jacket back on and started to walk again. Thunder could be heard in the distance, yet we carried on. Lightning bolts flashed across the valley. All of sudden, the heavens opened and, punctuated with flashes of lighting and booming thunder, the rain pelted down on us. We were right out in the open, so, sauve-qui-peut, we ran a few hundred meters and found shelter beneath a road underpass. As luck would have it we were just a short distance away from the railway station. Waiting for the next train home, we didn’t look very glamorous: hair plastered to the head, wet shoes and clothes and my grandfather’s jacket dripping wet – he had not brought an umbrella. The other group was also caught in the rain and drenched, few having brought rain gear, but before the return trip they took the precaution to ‘warm up’ in the nearest restaurant where they enjoyed some of the local white Johannisberger wine from the Valais with a plate of raclette. They arrived home shortly after 10:00 p.m.
My father, despite the purely ‘medicinal application of wine,’ was sneezing and developed a nasty cold. My grandfather declared this was the last time he was being ‘put out’ on such a marathon hike. I got a day off from school because I had a big blister on my heel and, besides being exhausted from the experience, also developed a cold. 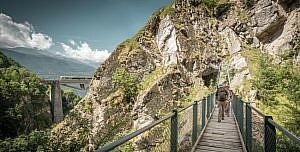 Nevertheless, I can say that the walk down the Loetschberg valley of our fifties family hike in Switzerland was a very beautiful experience which I can recommend highly; – just do pack rain gear, even in the summer! Have you hiked in this part of Switzerland? 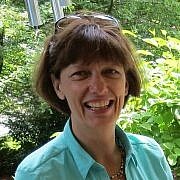 Please share your experience and leave a comment for the author below. Thank you. 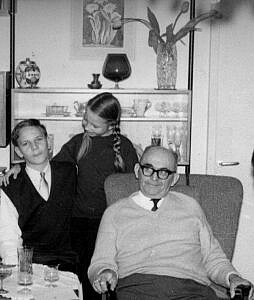 Above: author Daniel von Känel (far left), approximately eight years after the family hike, shown here with his sister and grandfather in the Switzerland of the fifties. Today, Daniel lives and hikes with his own family and grandchildren in Western Canada.